Human nature and "reason." 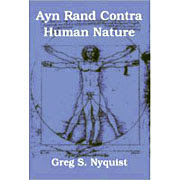 Rand places enormous stress on individual conscious reasoning. "Reason" is her chief moral virtue and is considered a necessity to man's survival. Not surprising, Rand regarded "reason" as particularly important in ethics. Rand regarded any attempt to derive ethical behavior from intuition or gut feelings or emotion as mere "whim worship," which she denounced in fierce, vigorous language. There are several problems with this point of view, some of which have already been explored on this blog. In the first place, it is logically fallacious to reason from two is premises to an ought conclusion, something Rand appears not to have understood. Secondly, it is psychologically impossible to derive a moral end solely from reason. Reason is a method, a means for attaining an end. But an end must be wished for it's own sake, because it satisfies some sentiment or desire. Reason can never provide that end by its own resources alone. And finally, there exists an immense body of research demonstrating that reason is not used to make moral decisions; on the contrary, where reason comes in is after the decision has been made. The role of reason is not to make moral choices, but to defend them after the fact. We Just Live In It. Weiss (Wall Street Versus America, 2006, etc.) jumps headfirst into the complex socio-cultural maelstrom that that was Ayn Rand, spotlighting her allies, enemies, nemeses and acolytes. The author has been in the trenches of financial reportage since before Black Monday 1987, examining corruption, mob involvement, takeovers, bailouts, regulatory scandals and a long list of game-changing power plays in every corner of the stock market. Here the author looks at Rand’s immense influence on a variety of sectors of American life, especially politics and economics. If you thought her renowned novels Atlas Shrugged and The Fountainhead had been analyzed under every possible microscope, think again. Intrigued by a 1974 photo depicting Rand with Alan Greenspan and President Ford in the White House, Weiss embarks on a quest to excavate the oft-shifting strata of Rand's political doctrine, Objectivism, which she deemed “a philosophy for living on earth," starting with her infamous writings. 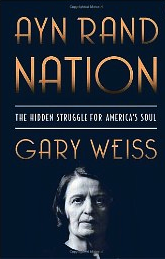 The love-hate lens through which our society continues to view her self-interested, capitalist canon is, in Weiss' dogged hands, meticulously eye-opening—yet it remains confounding to conservatives, libertarians and liberals alike. Anointing her "the godmother of the Tea Party,” Weiss argues that Rand's influence on Greenspan, Timothy Geithner, Ben Bernanke and other major players in the contemporary financial and legislative landscape is significant; she suggests that the anti-government seeds she planted may now be taking root. Weiss writes, "[s]uch is the Ayn Rand vision of paradise: an America that would resemble the lands from which our ancestors emigrated, altruism confined to ignored, fringe texts, grinding poverty and starvation coexisting alongside the opulence of the wealthy." A scrupulous and sobering investigation, vital for our times.